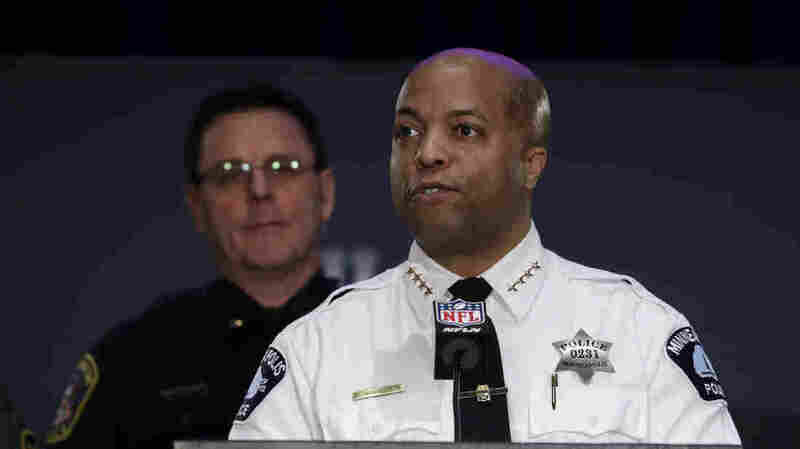 No More Undercover Arrests For Selling Small Amounts Of Pot In Minneapolis On Thursday, Police Chief Medaria Arradondo said enforcement, particularly downtown, has disproportionately impacted African-American men. Minneapolis Police Chief Medaria Arradondo speaking during a security news conference in advance of the Super Bowl 52 football game, on Jan. 31, 2018. On Thursday, Arradondo said police will no longer arrest people for selling small amounts of marijuana. The Minneapolis Police Department said violent crime in a targeted two-block stretch of downtown has dropped by nearly a third compared to the same time last year. But at a news conference Thursday, Chief Medaria Arradondo acknowledged that his undercover officers also had arrested dozens of African-American men just for selling small amounts of marijuana. "We took a look back and we analyzed and we saw that, while we were making the arrests and we were keeping guns off the streets down there, we were seeing a segment of the population that was being disproportionately impacted," he said. But Mary Moriarty, Hennepin County's Chief Public Defender, said 46 of the 47 people arrested for selling pot during the sting were black and low-income. Moriarty said the defendants her office represents weren't accused of minor drug offenses — prosecutors charged each of them with a felony for selling a few joints worth of weed. In Minnesota, possession of fewer than 42.5 grams is a petty misdemeanor, similar to a traffic ticket. "But by virtue of the fact that police were approaching people and buying one or two grams, those people wound up getting charged by the county attorney's office with felony drug sale," Moriarty said. One defendant, who had a prior record, was sent to prison after getting caught selling a tiny amount of pot. Moriarty said regardless of what police did, the county attorney's office should have never filed felony charges. In a statement released several hours after Arradondo's news conference, Hennepin County Attorney Mike Freeman said he's already dismissed, diverted or requested stays of adjudication in a quarter of the cases, and is in the process of dismissing the others. Freeman also said he took immediate steps after learning about the situation on Tuesday. But Moriarty said that's disingenuous, because her staff has been asking prosecutors about the cases ever since they filed the charges. Moriarty applauded Mayor Frey's order ending the low-level marijuana stings. So does John Gordon — the executive director of the American Civil Liberties Union in Minnesota. "We are hopeful that this attitude is going to then spread to other kinds of low-level arrests that contribute to disparities in our criminal justice system," Gordon said. "We're continuing to look at those disparities and to work with the city of Minneapolis and all levels of government to address racial bias." In a statement, Frey said marijuana should be a "lowest level enforcement priority and that it should be fully legalized at the state level." He did add that legalization would not negate the need for police to get guns off the street and end the sale of life-threatening narcotics such as heroin. Later Thursday afternoon, department spokesperson John Elder said the MPD will continue its operations focusing on crime deterrence and livability, and will still make arrests for marijuana violations "when appropriate."